Cat facial infections are not uncommon, and are usually a sign of something else going on, including food allergies and mite infestations. Share a few visitors' stories. Hello, I have a cat that has some kind of skin infection on his face, neck and feet area, as well as a few other places. I have taken him to the vet several times, but so far he hasn't responded to the treatment prescribed. I've treated him with Kaptan, as well as some tablets. When I give him a bath it clears a little, but a couple days later his skin bleeds and there is a very funny smell. He suffers hair loss on the above mentioned areas and he scratches a lot. My cat is only about is about two years old and is very thin. He eats a lot and drinks water, and is not active. Instead, he seems to like to sleep under any material that's comfortable. The vet has given up hope on treating him successfully. Please, can you help me and my cat? He has a lot of scabs all over his body and appears sweaty and a little hot. Is it ringworm or something else? Please help. 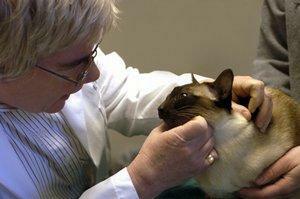 Unfortunately, I'm not a vet and there is no way I can diagnose the current problems with your cat. There is just too much going on here. What I do recommend is starting over with a completely different vet, and provide him/her with a complete list of all of your cat's symptoms. Your cat needs a complete work up to diagnose the cause of her infection and hair loss; this includes blood work to look for disease, and skin scrapings to check for parasites. The odor may also indicate a yeast infection, but I honestly can't be sure. A dedicated vet does not simply give up. He/She rolls up the sleeves and goes back to the drawing board. I firmly believe your cat's problem can be diagnosed and treated. Please let us know what happens next. I just noticed that my Tabby has scabs around her mouth, in front of her ears, under her chin, and on her neck. She also has a couple on her paws and upper back. A couple of days ago, she started sleeping in a dark closet during the day, which is a change. I started switching her over to a new dry food three days ago, so I thought perhaps that's the problem. She also managed to sneak outside when the door accidentally opened. There are fire ants in the area, so I wondered if it could be ant bites, even though I didn't notice any ants on her when I brought her in. Any ideas as to how to how to proceed from here? If it were my cat, I'd proceed by taking her to the vet to have him/her look at the scabbing first hand. They seem to be concentrated at the front end of the body, correct? This would lead me to think she got into something, so perhaps the fire ants could be the culprit. Do they look like she could possibly have gotten into a fight with another cat during her time outdoors? A food allergy can also surface as a skin reaction, so the new food could play a role in the scabbing, but since they are concentrated mainly on the head, I still tend to think she got into something. As for sleeping in a dark closet, how warm is it in your house this time of year? Cats love to curl up and nap in dark nooks, and she may find the dark area cooler and more to her liking. I really don't think this issue is connected to the scabbing, but just to be safe, you should give the closet a thorough going through. In the meantime, don't pick at the scabs, just let them dry up and fall off naturally, unless your vet comes up with another solution. Carmex, my 16-month-old cat, has scabbing around her neck and chest. She has been hiding behind the window curtains or in the closet most of time. I know she doesn't feel well because she has glassy eyes, and sometimes she meows strangely like she's calling out but not looking at anyone in particular. She's back to eating and drinking and using her litter box, but she's still uncomfortable outside of her hiding places. I love her to death, and I hope you can help! Was there a time when your cat wasn't eating, drinking and using her litter box? She must have been feeling quite unwell to get that far off her usual routine. I'm glad to hear that the situation has improved at least that much. Food allergies: Scabbing is usually worse around the face and neck. Have you changed brands lately? Flea allergy dermatitis: Intense itching caused by even a single flea can lead to scabbing. Ringworm infections: The skin scabs over, then hair loss often follows. Mite infestations: Mites cause itching, which leads to scratching, scabbing and hair loss. Bottom line, you're going to need a vet to diagnose the actual cause of her condition and prescribe a course of treatment. I truly hope you can get to the root of her problem so she's back to her old self soon. What Are the Most Popular Cat Breeds?